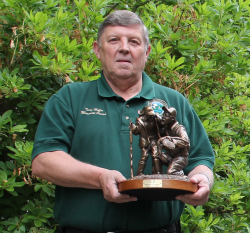 ANOKA, Minnesota – June 15, 2015 – Federal Premium® Ammunition is proud to announce the 2014 International Hunter Education Association (IHEA-USA) Volunteer Instructor of the Year. Steve Mills of Toledo, Washington earned the distinguished award due to his tremendous contributions in hunter education. In 2014, he taught 32 student classes and certified 800 students. He also taught six new instructor classes, certifying 45 additional hunter education instructors. Additionally, Mills was responsible for developing new teaching aids that are used by instructors all over Washington, and helped develop the online hunter education program in the state. Federal Premium announced the award on May 21 during the 2015 IHEA-USA Annual Conference in Des Moines Iowa. Steve Mills received the award at a Washington Fish & Wildlife Commission meeting on June 12. David Whipple, Wildlife Program and Hunter Education Division Manager for the Washington Department of Fish and Wildlife, nominated Mills and an IHEA-USA selection committee named him as a finalist. Federal Premium supports numerous conservation organizations, participates in many ammunition royalty programs, and provides a variety of shooting sports educational materials. To learn more about Federal Premium’s support, please visit: http://www.federalpremium.com/education.